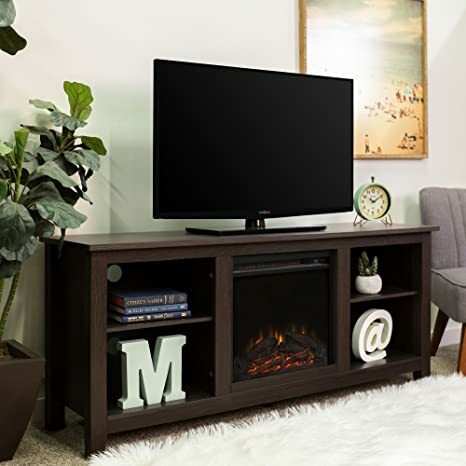 Create a warm, entertaining space in any room of your home with this media stand with electric fireplace. Crafted from high-grade MDF with a durable laminate finish to accommodate most flat panel TVs up to 60 inches. Features adjustable shelving behind two side cabinets to fit your components and a cable management system. Installation requires no technician, simply plug into standard household outlet and no venting required. 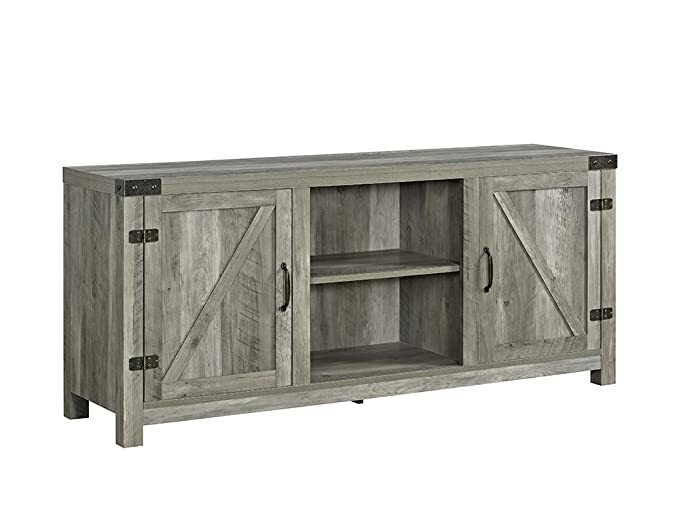 Include our rustic barn door style TV stand in your home to not only enhance the dcor of your living area, but create ample storage for all of your media, accessories, and more. Constructed of high-grade MDF, this durable, long lasting stand supports most TVs up to 58. Its the perfect addition that will keep your living room looking neat and give it a homespun feel. 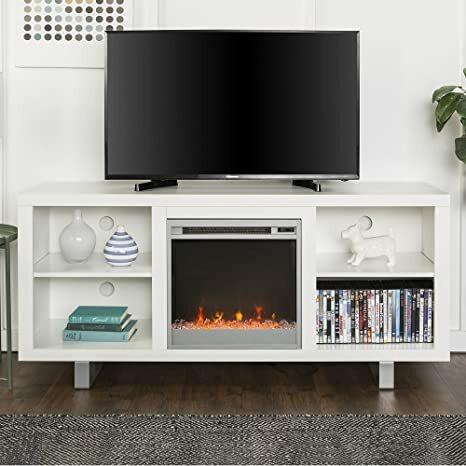 Create a warm, entertaining space in any room of your home with this media stand with electric fireplace. 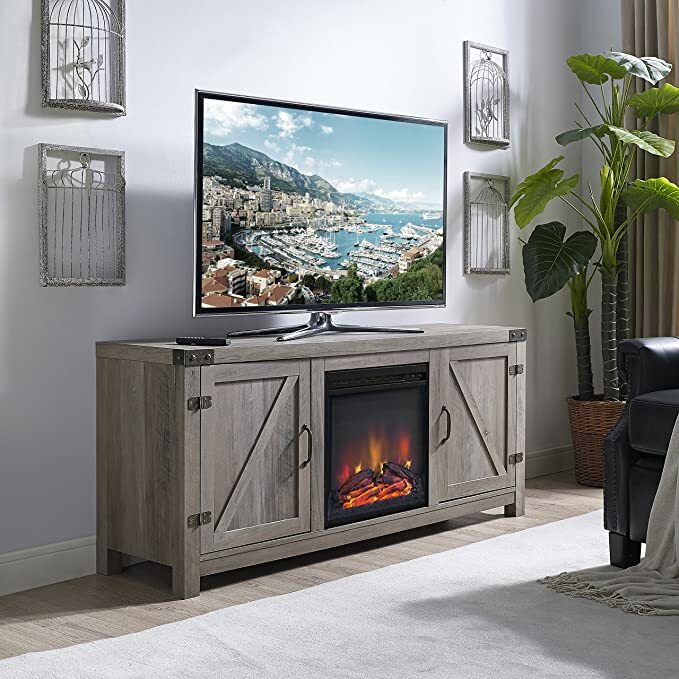 Crafted from high-grade MDF with a durable laminate finish to accommodate most flat panel TVs up to 60 inches. Features adjustable shelving to fit your components and a cable management system. Installation requires no technician, simply plug into standard household outlet and no venting required. 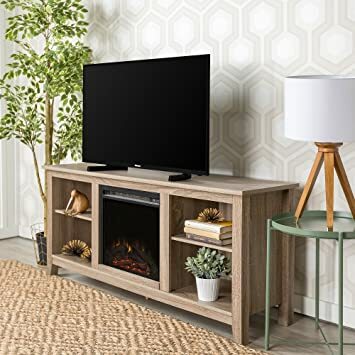 This cozy fireplace TV stand is the perfect piece to give your living or family room area a charming country feel. 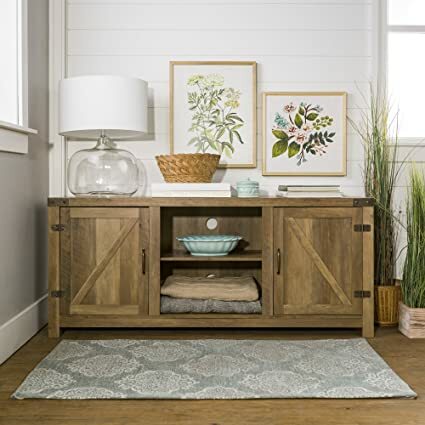 Features concealed storage space with side doors with adjustable shelving to fit your media and accessories. Includes a fireplace insert to warm up when it gets chilly thats easy to use and requires no electrician or venting. 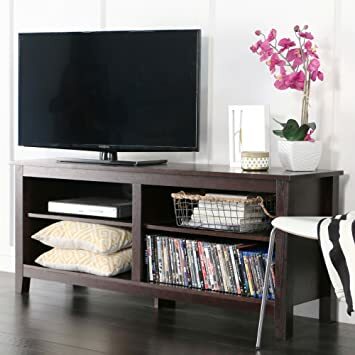 Style and function combine to give this contemporary TV stand a striking appearance. The design creates a classy, urban look crafted from high-grade MDF and durable laminate. Console accommodates most flat-panel TVs up to 60 in. Features adjustable shelving that provides ample space for A/V components and other media accessories. Display your TV in style with this media stand. Crafted from high-grade MDF with a durable laminate finish to fit your home dcor. Includes adjustable shelving to fit your media components and accessories with a cable management system. It will accommodate most flat-panel TVs up to 60 inches. 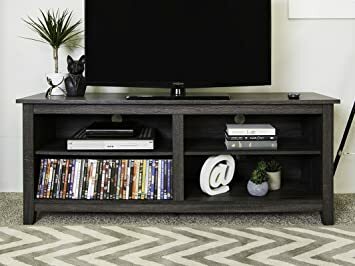 Featuring spacious and adjustable shelving to display and store your media accessories and decorations, this stand offers the perfect blend of fashion and functionality. Sleek, metal legs and an attractive, crystal fireplace insert combine to create a contemporary presence in your living space. The electric, plug-in insert can be used to give off heat if needed, or simply add an aesthetic appeal to your living room with the flip of a switch. 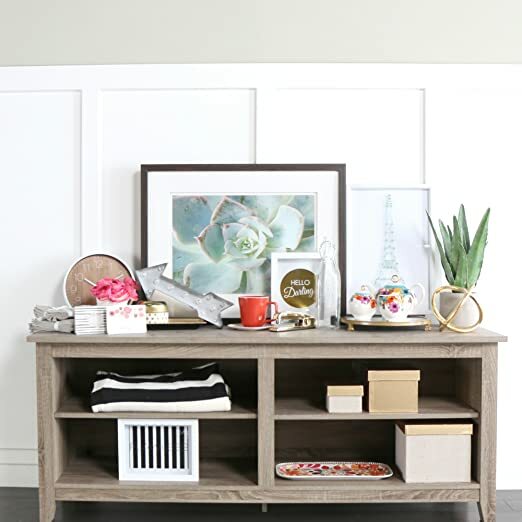 Style and function combine to give this contemporary 58 inch TV stand a striking appearance. Features adjustable shelving that provides ample space for A/V components and other media accessories. 58″ Long by 24″ tall by 16″ deep. Style and function combine to give this contemporary TV stand a striking appearance. The design creates a classy, modern look crafted from high-grade MDF and durable laminate. Console accommodates most flat-panel TVs up to 60 in. Features adjustable shelving that provides ample space for A/V components and other media accessories. 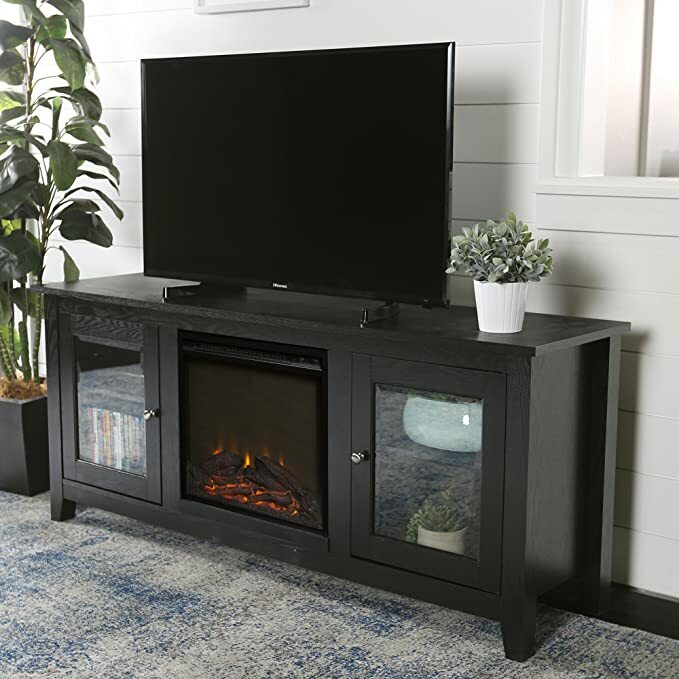 Enjoy a warm, comfortable space in any room of your home with this media stand with electric fireplace. Made from MDF with a durable laminate finish that can hold flat panel Televisions up to 60 inches. Features adjustable shelving to fit your components and a cable management system. Installation requires no technician, simply plug into standard household outlet and no venting required.